As we are nearing the second anniversary of the Fukushima Nuclear Disaster, Taiwan’s government still has not yet taken its lesson from Japan’s catastrophe and insists on going ahead with the operation and construction of nuclear power plants in Taiwan. 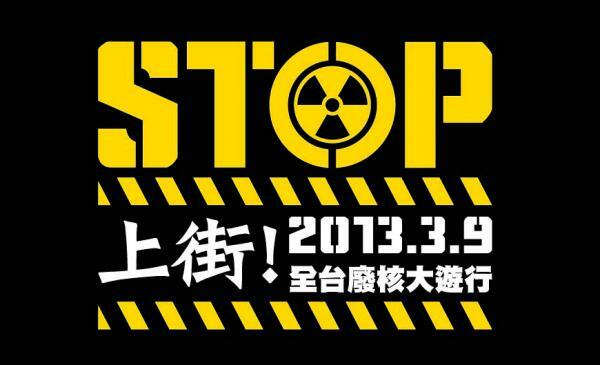 2013 is a critical year for Taiwan’s anti-nuclear power movement. Demonstrations throughout the island will bring together a broad coalition of anti-nuclear power groups and individuals, forcing the government to face an issue it has avoided for too long. As the second anniversary of the Fukushima Nuclear Disaster approaches, the victims of the disaster are still recovering from the destruction caused by radiation leakage. Much to our disappointment, the Taiwanese government has not learned from the Fukushima catastrophe and still refuses to halt the three nuclear power plants in operation in Taiwan. Even with the fracturing of an anchor bolt in Second Nuclear Plant, the government decided to resume production at the plant under grave risks to safety. Meanwhile, the escalating volume of nuclear waste inside the power plants and at the disposal facility on Orchid Island, home to the Tao people, is another problem the government has not taken action to resolve. More alarming is the commencement of fuel rod installation at the Fourth Nuclear Plant. During the course of construction and testing, there have been repeated delays as well as serious accidents and scandals, leading many experts to declare that it would be impossible to guarantee plant safety. However, the government and the plant owner and operator, Taiwan Power Company, are plowing ahead with their original plans for the plant, adding another 50 billion NTD to the budget to make the total cost of construction close to 350 billion NTD. Orders to hasten construction so that fuel rod installation would be complete by the start of 2014 were designed to make subsequent suspension of the Fourth Nuclear Plant’s operations impossible. The shoddy construction of the Fourth Nuclear Plant means that the installation of fuel rods poses a huge threat to our island! But support for the anti-nuclear movement is growing. More and more people are becoming aware of the serious dangers nuclear power production poses to our island and the absurdity of Taipower’s predictions of sudden electricity price hikes without it. Existing anti-nuclear-power organizations have joined forces with new grassroots movements all around Taiwan to express loudly and clearly: we don’t need nuclear power. What we need is a safe, fair, and sustainable environment to call our home. 2013 is a critical year for Taiwan’s anti-nuclear energy movement. Demonstrations throughout the island will bring together a broad coalition of anti-nuclear energy groups and individuals, forcing the government to face an issue it has avoided for too long. This year, with the impending installation of the fuel rods at the Fourth Nuclear Power Plant, we are taking to the street again as we did last year and the year before to make our government understand that only the Taiwanese people can decide their own future, and we choose a future without nuclear power. The Fourth Nuclear Plant will never be safe until its construction is terminated. Let’s say goodbye to nuclear power! 3:00PM Ketagalan Blvd.→ ZhongShan S. Rd. → Roosevelt Rd. → NanHai Rd. → HePing W. Rd. → ZhongHua Rd. → HanKou St. → GuanQian Rd. → ZhongXiao W. Rd. → GongYuan Rd. → QingDao E. Rd. → ZhongShan S. Rd. → Ketagalan Blvd. 6:30-9:30PM No Nuclear Evening Party on Ketagalan Blvd. Hsin Sheng Rd. → Chuan Guang Rd. → Jeng Chi Rd. → Guang Ming Rd. Defamation as a Tool to Silence Critical Academic Research in Taiwan: Formosa Plastic Group v. Tsuang.